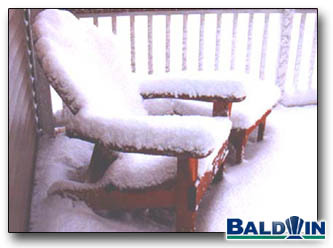 Here is a picture of my Baldwin Chair taken after a good February snow. This is all season furniture. You can leave it out all year long. Cedar is naturally rot resistant and bugs do not like to eat it. Cedar can be left outdoors without maintenance for many years without any problems. This is fine if you want the furniture to turn grey.